Depending on how much time you have, your dinner might be a simple affair or a full spread with subzi, dal, roti and rice. Dinner is usually lighter than lunch, but nonetheless you can place a bit of variety on the table. 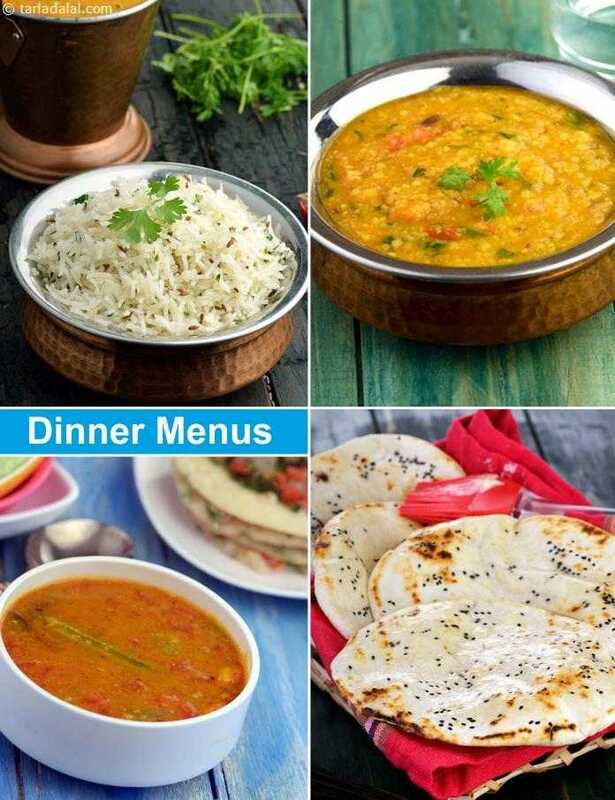 You can go for a traditional North Indian or South Indian dinner, or try something from other parts of the globe, like a Chinese, Lebanese, Thai or Mexican meal. We have combined some of our favourite recipes into five dinner menus, one for each day of the week. On days when you have time, you can prepare the whole menu. Once you learn to do things simultaneously, with a bit of planning, you will realise that it doesn’t take too long to prepare a full meal. That said, on days when you are dog tired and barely have any time, you can just pick one or two dishes from the menu and give it a shot! Tarla Dalal Hi Emelda, We do not advertise school lunchbox menus or school lunches. You can check out our Tiffin Treats section to find lunchbox recipes.